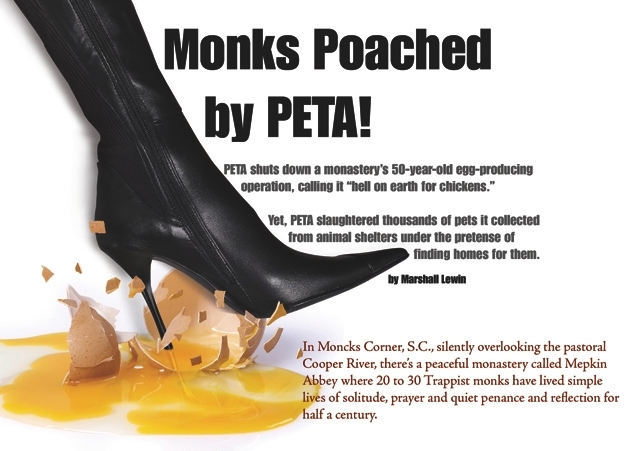 NRA-ILA | Monks Poached by Peta! For more than 50 years, these monks of the Cistercian Order, who are expected to live in poverty and support themselves by working with their hands, have eked out a Spartan living by raising hens and selling their eggs. But their idyllic way of life is coming to an ugly and abrupt end. After launching an "undercover investigation" of the monastery’s henhouses and following it with almost a year of complaints and publicity stunts, People for the Ethical Treatment of Animals (PETA) has succeeded in forcing Mepkin Abbey to shut down its egg operation. PETA’s complaint? That the monks treat the chickens cruelly. How? In short, by keeping them in cages and preventing them from pecking each other to death. In other words, by complying with every animal welfare standard established by the United Egg Producers. Yet with its trademark overheated rhetoric, PETA calls Mepkin Abbey "hell on earth for chickens," a place where the birds suffer "nothing less than torture." Indeed, in a letter to the monastery, PETA Vice President Bruce Friedrich lectured Abbot Stanislaus Gumula that, "Chickens understand sophisticated intellectual concepts, learn from watching each other, demonstrate self-control, worry about the future and even have cultural knowledge that is passed from generation to generation." The irony is that while PETA lamented losing untold eons of chicken culture and civilization in South Carolina, up at PETA headquarters in Virginia, PETA employees were slaughtering kittens, puppies and companion animals at a pace that would have made Jeffrey Dahmer wince. According to the Center for Consumer Freedom (CCF), recently released reports show that out of the thousands of dogs, cats and other pets PETA took in for "adoption" at its Norfolk, Va., headquarters during 2006, more than 97 percent were put to death by PETA. If nothing else, that explains why--as was revealed in courtroom testimony last year--PETA maintains a large walk-in freezer at its headquarters for storing dead animals. The fact is, very few escape. Despite raising more than $31 million and spending $27 million in 2006, PETA managed to find adoptive homes for a grand total of just 12 pets that year. You’ve heard of "one gun a month"? At PETA it’s "one survivor a month." The bottom line? For every one pet PETA placed in a new adoptive home, the group put 248 other pets to death. And that seems to be the norm. Do your homework by looking up PETA at charitynavigator.org and you’ll see the highest-paid employee listed--with an annual salary of $108,418--has the title of "veterinarian." But perhaps the compensation is in line with the labor. After all, this is a person who likely pumps pentobarbital by the train carload. Yet PETA officials have the audacity to call their operation a "humane society." Indeed, in February 2007, two PETA employees were convicted after being charged with 21 counts of animal cruelty. It appears that the two PETA employees drove to animal shelters and veterinary offices in and around Ahoskie, N.C., where they collected living dogs and cats on the pretense that PETA would seek out adoptive homes for the animals. But instead of finding homes for those dogs and cats--or even bringing them back to PETA’s Virginia headquarters--it appears the employees simply killed the animals in the company van, bagged them in commercial garbage bags and dumped them into a dumpster behind a Piggly Wiggly supermarket on the way back to work. Over a three-month period in 2005, more than 80 dogs and cats were found dumped that way. In January of this year, another PETA employee faced felony charges after being arrested for allegedly abducting a hunting dog and attempting to transport it to PETA’s headquarters--or, possibly, the nearest ditch or dumpster. If they were honest, People for the Ethical Treatment of Animals would re-name their group "People for the death-ical Treatment of Animals." Ask the Virginia Department of Agriculture and Consumer Services (VDACS). According to their records, among humane societies across the state, the average euthanasia rate was just 34.7 percent in 2006. PETA, by contrast, killed 97.4 percent of the animals it took in. All of which prompted the Center for Consumer Freedom to petition the Virginia state government for a change in PETA’s official status. "Given PETA’s apparent practice of killing animals shortly after they come in the door (or, in the North Carolina case, inside a cargo van), without making a good-faith effort to find them adoptive homes or provide necessary long-term veterinary care, its classification as a ‘humane society’ and ‘releasing agency’ seems inappropriate ... .
"PETA has killed over 17,000 pets since 1998," Martosko said. "Given the group’s astonishing habit of killing adoptable dogs and cats with such ruthless efficiency, it’s only fair that the state of Virginia refer to PETA, and regulate it in the future, as a slaughterhouse."